One of my biggest projects to date is a legged landing gear that allows helicopters to land on uneven terrain with large touchdown velocity. For a quick overview, please see the following video. Traditional helicopter landing gears generally consist of two tubular skids, or three wheels for larger helicopters. These designs require a very flat landing surface and a gentle touchdown. For rescue or military situations, these ideal conditions might not always exist—for example, a helicopter might have to land quickly on sloped terrain to dispatch troops while being buffeted by wind. 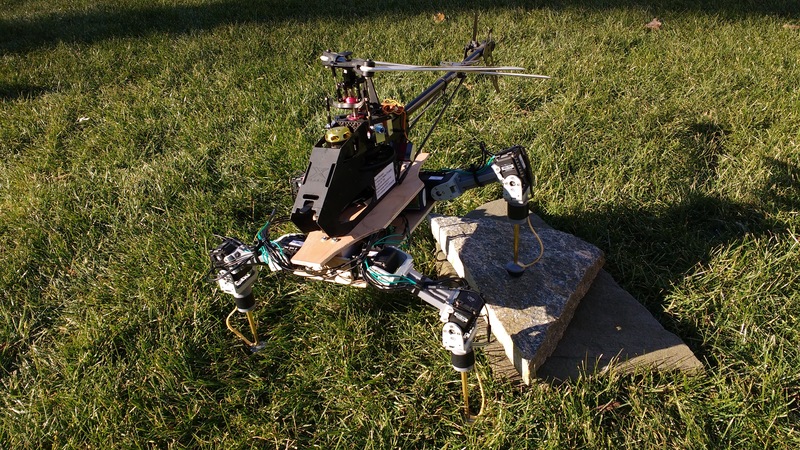 Enter Georgia Tech’s legged landing gear, which features four retractable legs that use force sensors in each foot to adapt to uneven terrain. As can be seen in the following image, the new gear can handle very uneven terrain. However, there did seem to be some possible areas of improvement. Georgia Tech’s landing gear, headed by Mark Costello. In the video demonstration, the helicopter was shown being lowered very gently and precisely. This is most likely due to a mechanical limitation of the gear: its inability to absorb landing shock. Each leg consists of two motors and two completely rigid links. Correspondingly, if the helicopter hits the ground with any considerable velocity, the landing force will be transmitted instantaneously without giving the legs any time to retract. 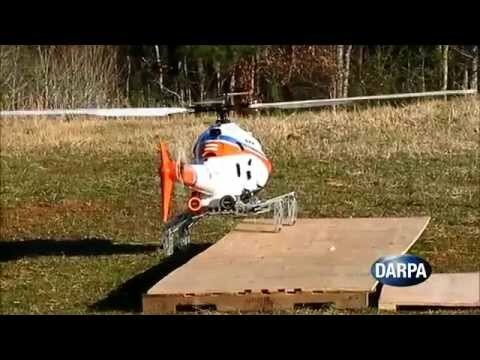 This would apply a torque to helicopter body, probably causing a crash. My improvement over the Georgia Tech design consists of adding a spring in the shank of each leg, absorbing the immediate shock and giving the motors enough time to react. As you will see in the following sections, this introduced numerous mechanical complexities and presented some interesting control problems. 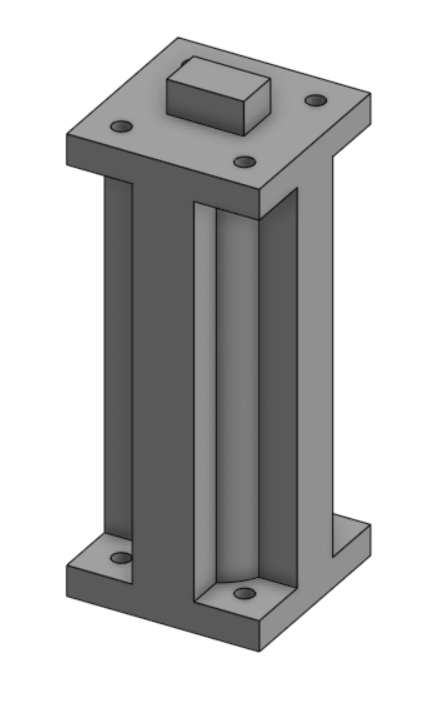 My first idea for the leg consisted of manufacturing my own series elastic actuators from 3D printed parts, using the design described here. After many iterations, it became clear that plastic, 3D printed parts had too much friction and imprecision to make this work. I then moved to including a spring in the shank of each leg, with force transmitted from the foot to the sensor through sliding brass tubes. The leads of the force sensor were threaded through a slit in the housing. 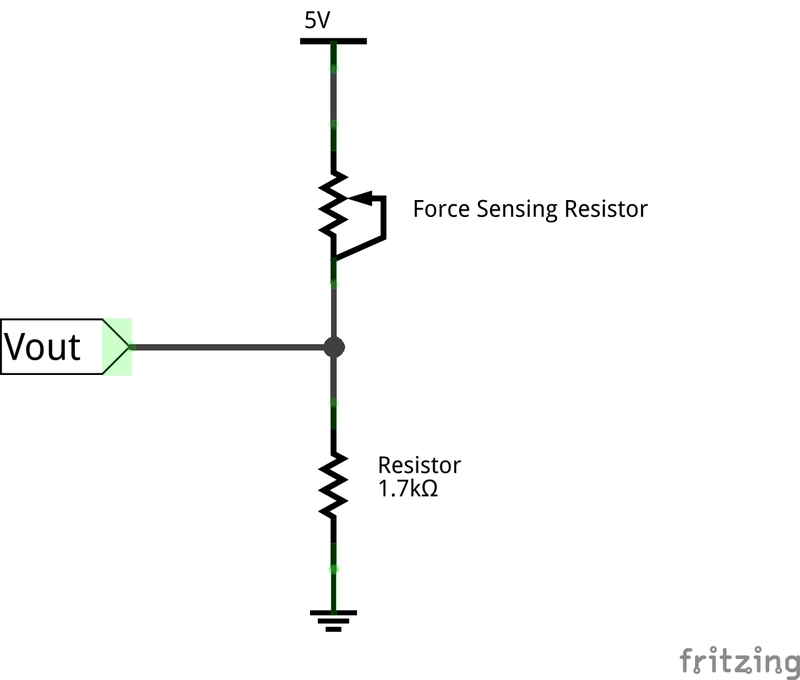 Two rubber frustums on each side of the sensor concentrated force on the sensor’s center, providing more reliable readings. I used hot glue to mate the two halves of the housing and the upper brass tube, and epoxy to connect the lower tube and the plastic foot. Finally, I lubricated the tubes and attached a rubber band between the housing and the foot to hold the shank together. The thigh of the leg was comparatively simple. The knobs and screw holes on each end line up with the F2 and F3 brackets for the two Dynamixel AX-12As. The 3D printed thigh part. All plastic parts were printed using a Lulzbot Mini and HIPS filament on high resolution. One thing I had to watch out for during assembly was that the zero position of the Dynamixel (indicated by the notch in the servo horn) was aligned in the direction of the attached limb. 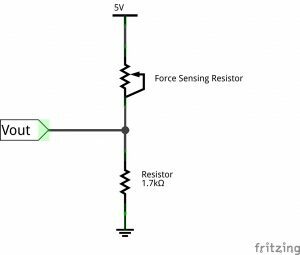 To read the resistance from each force sensor, I used voltage dividers with 1.7 kΩ resistors. 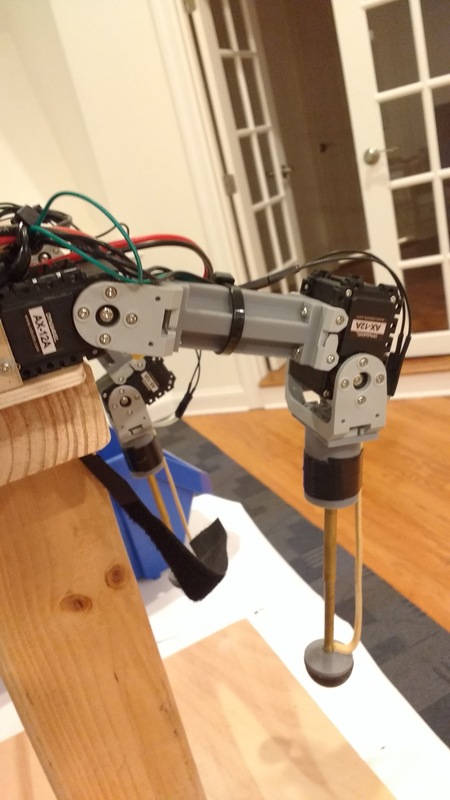 is connected to the analog in pin on the Arbotix-M. To figure out the force in newtons, I took a few data points with known weights and fit a regression. Once the mechanical design of the leg was finished, I started looking into different control strategies for cushioning landing impact. One that stood out to me in particular was Sliding Mode Control (SMC). Where is a control input and is the state. We then identify a sliding surface , where is called a switching function and represents the “distance” from a certain state to the sliding surface. The sliding surface is designed to achieve some arbitrary task objectives. For example, we might constrain the end effector of a four-bar linkage to move along a line; all states resulting in the end effector lying on the line would have , and all states off the line would have Finally, we pick a discontinuous control law that drives the state trajectory to the sliding surface. Control laws are classified according to how many time derivatives of they drive to zero. If the controller can enforce , it’s a first order controller, and usually appears explicitly in the first time derivative of (relative degree one). If the controller can enforce , it’s a second order controller, and usually appears explicitly in the second time derivative of (relative degree two). I say usually because there are some exceptions to the relative degree rule—namely, the super twisting SMC, which I’ll be using later. This is a first order sliding mode, since differentiating equation and plugging in gives , indicating a relative degree of one. Theoretically this controller should drive the position to in finite time and maintain it in on that sliding mode perfectly; however, in practical implementations this kind of control strategy results in a phenomenon called chattering where the control input switches very quickly across the surface. This can cause actuator wear and is generally undesirable. You may be asking yourself why the above controller would not be considered second order, since could clearly be made zero simply by zeroing . This is because of the chattering problem described above; in reality, wouldn’t be enforceable with this control scheme since would actually fluctuate rapidly between +1 and -1, resulting in . The crux of sliding mode control is picking a control law that quickly drives the state to the sliding surface while avoiding chattering. Many different controllers have been developed to solve this problem, and research is still ongoing in the field. One effective solution that I’ll focus on here is using a high-order sliding mode (HOSM) controller, which can enforce (at least) . I started testing various simple controllers by dropping one leg with varying heights/springs and examining ground reaction force graphs. My first controller just retracted the leg with full speed starting the instant it read a non-zero ground force (shown right). Force (N) vs time (ms), starting at touchdown. 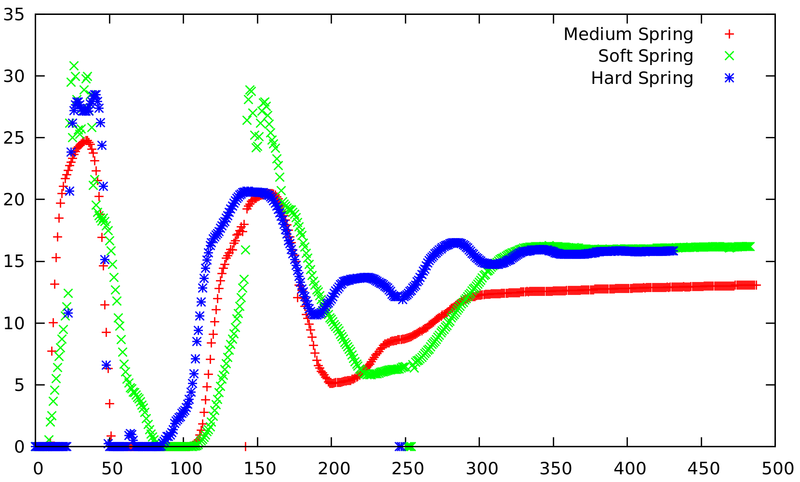 First let me apologize for the terrible graph; I originally wasn’t planning on doing a write-up and this was just some old testing data I found lying around. What’s important to notice though are the two humps in the graph, connected by a region of zero force. 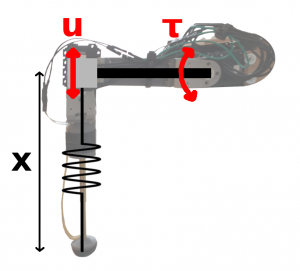 This meant that after an initial compression phase the leg retracted so quickly that it temporarily lifted off the ground before hitting ground a second time. Where is the length of the shank. In words, the controller tried to keep the compression of the spring constant and avoid force fluctuations. I assumed the control input to be the second derivative of shank length (in reality I controlled hip torque , but via linearization around the horizontal this can be approximated as a vertical acceleration at the knee). The simplified model, where u is a linearization of τ and controls the second derivative of shank length x. Then I applied equation 4, using 80 for and 20 for (hand tuned). This eliminated the earlier double-hump force profile, leaving just small hump after touchdown that drops down to a constant value. 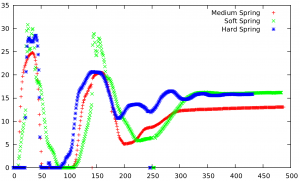 Unfortunately I can’t find a graph of the force profile with the super twisting algorithm though. The finished landing gear & heli in action. The gear ended up weight 1.2 kilograms, with a maximum leg length of 31 centimeters. I attached the gear to a Gaui X3, which weighed about 1 kilogram.